300 Year Tradition, 80 Year Prohibition, 10 Years to Produce, Only Seconds to Savor and Enjoy. Production of Bacanora was banned, Prohibition-style, in 1915 by the Governor of Sonora under Calles Law. At that time Bacanora was the number two economic activity in the state which due to the ban, went totally underground. If caught punishments were harsh causing fields that used to be planted with Agave to be switched to other agricultural products and ranching. 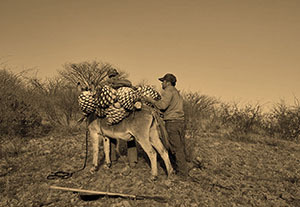 In 1992, the ban on the production of Bacanora was lifted, but the only Agave available was what could be harvested from the wild. Fields today are once again being planted with Agave, but it takes six to seven years for a plant to mature and be usable. Therefore, the capacity for production is currently low. However, with each year the capacity for production grows giving the Bacanora industry a bright future. In 2005 The Mexican government issued Bacanora a NOM certification #168-SCFI-2005. This means Bacanora must be made of 100% Agave Pacifica (Augustafolia Haw) and grown only in the state of Sonora, Mexico. All is in place for growth of this industry and exportation of its products. Finalmente!